Stock photo of pizza ovens, Plaza de la Corredera, City of Cordoba, UNESCO World Heritage Site, Province of Cordoba, Andalusia (Andalucia), Spain, Europe. 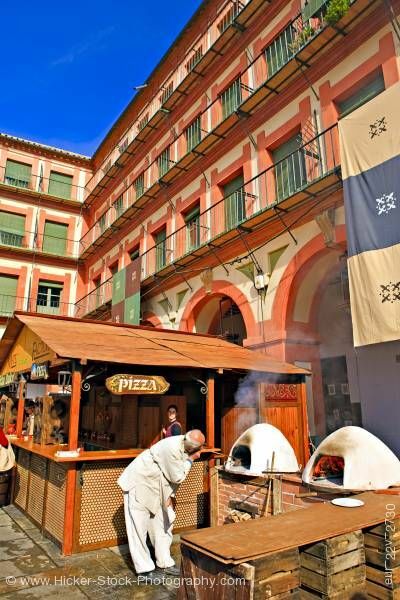 Pizza ovens and pizza stand in the Plaza de la Corredera in the city of Cordoba. This stock photo shows the stone pizza ovens, Plaza de la Corredera, City of Cordoba, UNESCO World Heritage Site, Province of Cordoba, Andalusia, Spain, Europe. Along the Plaza de la Corredera is a pizza stand. Two small dome shaped pizza ovens sit on a brick wall next to the covered stand. A man leans towards the ovens as he checks the pizzas baking. A small cloud of smoke is coming from one of the stone ovens. A woman stands behind the counter of the pizza stand. The stand sits in front of the archways of a large four-story building. The building is trimmed in bright colors of green and pink. Hanging from the second floor is a blue and tan banner. Pizza ovens, Plaza de la Corredera, City of Cordoba, UNESCO World Heritage Site, Province of Cordoba, Andalusia (Andalucia), Spain, Europe.